Just a quick photo-addled post to show just how much the Rainiers roster has turned over since my last post. Joining the bottleneck at 1B/LF/DH is Brad Nelson, acquired from the Brewers about 2 weeks ago. He's had less than 20 ABs with the R's so far, and hit his first HR for Tacoma on Sunday. Today, the Nashville Sounds came to town - the team Nelson played for from 2005-2008. So far, the 265-270lb Nelson's playing mostly in the OF corners, which looks like a disaster waiting to happen, but Nelson actually gets a decent jump and covers a bit of ground out there. He's not fast, so I'm not saying he's Endy Chavez, but he's done well so far - especially after a somewhat rough first game on Thursday night. In addition to Nelson, Jack Zduriencik also picked up CF Jerry Owens, who'd been let go by the White Sox. Owens starts most games, pushing Prentice Redman into a corner OF slot. Owens and Nelson are more properly thought of as organizational depth - not quite minor league vets who sign a new MiLB contract each year with little hope of seeing the big leagues, but not prospects either. Adam Moore is clearly a prospect, and since his arrival a few weeks ago, he's gotten nearly every start at catcher, and his presence in the starting line-up seems to reinforce the idea that Jeff Clement's days as a catching prospect are over. Clement is now DHing due to knee troubles, but it's somewhat unlikely that they'd push Moore back to West Tennessee even if Clement gets a full bill of health. Moore hasn't hit for too much power; his swing looks good, though, and he should start racking up some 2Bs at the least -he had one today. He's also shown impressive plate discipline. 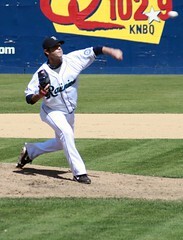 With Jason Vargas and Garrett Olson now in the M's rotation, the Rainiers now feature Doug Fister in the rotation. 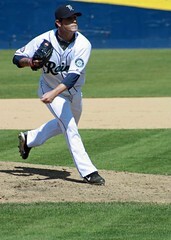 The 6'8" righty hasn't been as sharp in the rotation as he had been in the pen, but he's done fine so far. I don't think he'd miss a lot of MLB bats, but he's got impressive control, running a ridiculous 26:2 K:BB ratio so far. Another guy the M's may utilize in the near future is LHRP Tyler Johnson, now healthy after surgery that kept him out all of 2008. The ex-Cardinal throws a high 80s FB with a good slider. 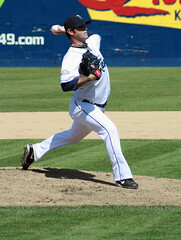 The impressively-inked Johnson made his 2009 debut on Sunday, throwing a 1-2-3 inning against Memphis, and using only 8 pitches. In another note - I read in Baker's article this morning, that Griffey's hole-in-one HR into the Subway promotion won't net him the advertised $25,000. I would file a false advertising complaint and sue Subway for $250,000. Twenty-five thousand can buy a lot of ties.